As an empath how do I know if an emotion is mine or someone else's? As an empath how do I know if an emotion is mine or someone else’s? As an empath it is important to know and understand if an emotion is yours or someone else’s. To make sure your emotions aren’t being activated you first need to know your top fears and insecurities. 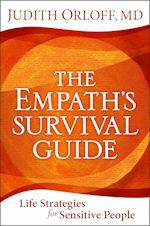 (Read my books, The Empath’s Survival Guide and Emotional Freedom for strategies.) For instance, are you afraid of depression, lack of success, or illness? The reason this is important to know is that these are the areas where you may be projecting your own fears onto others. If you have doubt about where the emotion is coming from, take a few moments to meditate, center yourself, ask that your fears be lifted, then tune in again to the other person to see if the emotion is coming from them. Also a quick way if you are say, at a party or a gathering, is to simply move at least 20 feet away from the person, out of their energy field. If the emotion dissipates, it was probably coming from them!